Looking for a fun way to decorate your home for Halloween season? Trick or treaters will love these mason jar mummies! They are easy and fun to make with kids, too! Wrap gauze around mason jars multiple times. Place LED candle inside the jar. Put finished mason jars around the house as decorations! This is a fun, yet interactive and easy way to get kids excited for Halloween! Paint popsicle sticks orange, white and black. Let them dry and glue them together in star form. 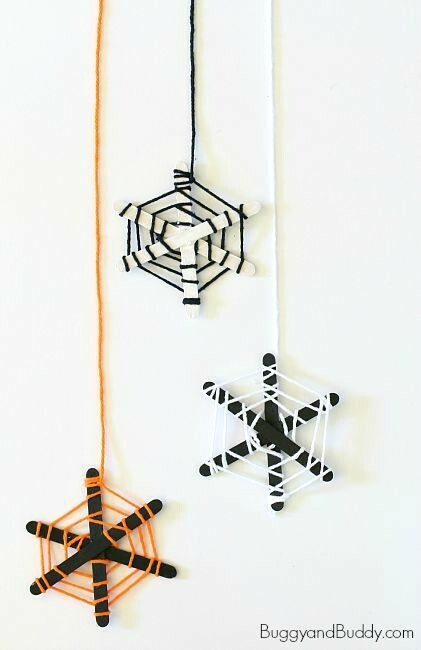 Wrap yarn around popsicle sticks to make it look like a spider web. Leave one long piece of string for hanging. Glue on a plastic spider.